You might be considering learning to drive? Which cars you like the best or which are the easiest to drive perhaps? But want to know what’s the difference between manual and automatic cars? The difference between manual and automatic cars is the transmission. The engine provides the power the wheels, whilst the transmission through a set of gears and cogs (much like those you find on bicycles) provides the ability to control the speed of the wheels. Again, like a bicycle, the higher the gear, the faster you go. All cars, both manual and automatic (other than the occasional exception) have a clutch. In order to change up and down gears, the engine and transmission must first be disengaged from the drive wheels so that a new gear can be selected and once again re-engaged when the new gear is in place. 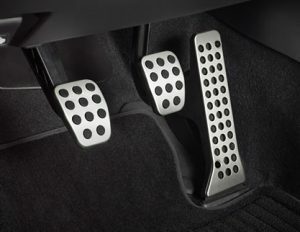 In a manual car, this is done via the clutch pedal where the driver pushes the pedal to the floor, selects the appropriate gear using the gear stick, or gear shifter and lifts the pedal back up – which once again connects the engine, the gearbox (transmission) and the drive wheels together. Used to temporarily disengage the engine and transmission from the drive wheels whilst a new gear is selected. In a manual car, the clutch pedal must be physically pushed down to disengage the system and lifted when an appropriate gear is selected. In an automatic car this process is all done for you. In a manual, operating the clutch, particularly for new drivers often results in stalling. Stalling occurs when the clutch is lifted too quickly, usually when moving off from a stationary position. You cannot stall an automatic car. Manual car gear stick. Forward gears 1-5 along with one reverse gear. Used to change gear ratios in order to gain or reduce speed. 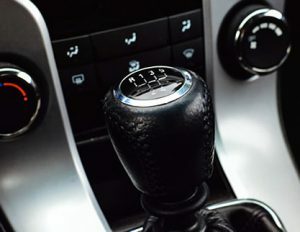 In a manual car the gear stick (or gear shifter) must be manually operated alongside the clutch to select a higher or lower gear. In an automatic car, via a system of electronic, mechanical and computer processes, the system detects the most appropriate gear based on speed and road conditions (such as whether you’re driving up a gradient for example). This entire process is all done automatically for you. In a manual car, the driver will have a choice of one to five, possibly six or even seven gears to choose from. The driver must listen to the engine and take into account the road conditions and based on that information, select the appropriate gear. Depending on the make and model, some automatics will provide a certain level of gear control. For example, you operate the gear selector from drive (‘D’ fully automatic) into 1st or 2nd if you are descending a steep hill for example. There may also be a ‘sports mode’ which allows the engine to maintain higher revs – keeping it in the same gear for longer. Automatic or Manual Driving Lessons, Which Should I Choose?